Looking for a great get-away? Whether you are looking for a quiet relaxing get-away, or are just looking to enjoy what Allegany County and surrounding areas in the Southern Tier can offer, Breezy Point is a great destination. Find natural beauty, unique shops, camping, fishing, hiking, plus so much more at our grounds and in our area. 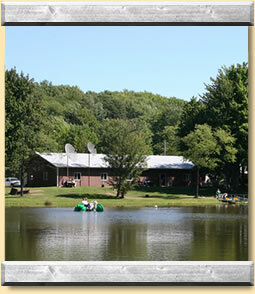 Breezy Point Campground offers family campers daily, weekly and seasonal camping at reasonable prices to fit your family budget. Six small lakes provide plenty of areas for fishing and non-motorized boating enjoyment. Every Holiday weekend brings on a barbecue...rain or shine! 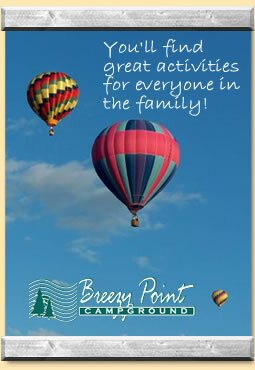 Come stay with us at Breezy Point campground, where there is something for everyone. We're a campground where you come as a stranger but leave as a friend. Please use our Web site to explore our facilities, view photos, see our calendar of events, or make a reservation. Deposits and visitors fees are subject to certain payment terms and conditions. Please read all of our policies here. Breezy Point Campground is open May until October. Make sure to check our calendar of events for great activities in and around our grounds. We welcome your furry friends. But, they must have up-to-date proof of vaccinations, and not be loud or vicious. Come and enjoy our new pool during your stay with us. Whether you're looking to enjoy an afternoon of swimming or just looking for a place to relax and enjoy the sun, our new pool area is perfect. The pool opens Memorial Weekend and closes after Labor Day Weekend. We are going GREEN! Recycling is being made easy for you. All recyclables now can be placed in one bin! The recyclables will be sorted for you. If you are looking for something for the kids, or something for you to do, then you pleased to learn that we will now be offering crafts every Saturday afternoon. Campers will find that our crafts are fun for all ages! Copyright © 2009 Breezy Point Campground. All rights reserved. Site by Webdezyners.